Director James Wan is really excited about Aquaman. And he should be. Wan has made a unique superhero movie. It’s both a sequel to other films, as well as a standalone origin story. It creates incredible, huge new worlds and does it with a glee that harkens back to the film’s comic book roots. In an interview, Wan discussed why he decided to go with that playful tone, how he decided to set the film after Justice League, what that changed about the movie, his proudest achievements in the film, and more. 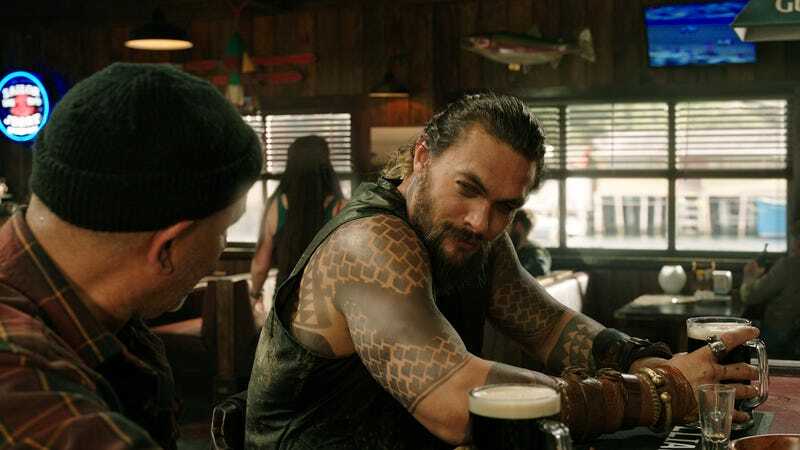 Germain Lussier, Gizmodo: One of the things I enjoyed about Aquaman was how self-aware it was. Was that intentional? James Wan: Well, I definitely wanted to make a playful, tongue-in-cheek film— serious in spots but not take itself too seriously. I mean, jeez, this movie is about a character who has the ability to communicate with marine life! I tried to have fun with that. But at the same time, not have people make fun of the character like he has been made fun of the past if that makes sense. So it was a bit of a tightrope I had to walk. Gizmodo: So how do you walk that tightrope? How do you stick with that tone, work in serious parts, but also give it the scope and this huge adventure? Wan: Really, I pulled most inspiration from the comic book. The comic book has all those elements of high sea adventure, fantasy, shades of horror slash sea monsters, and this wondrous magical sci-fi fantasy. It has a little flavor of everything. So, going into it, I knew I really wanted to be respectful of all those sorts of different flavors that it has. But I wanted to hang all of them on a very simple, classic story arc. So the story is very straightforward: a guy that has to pretty much challenge his brother to the throne but then realises he’s not physically strong or mentally prepared at that point to take on the brother and has to find another way to do it. And, ultimately, it becomes a classic quest movie. So, yes, keeping the narrative more straightforward really allowed me to hang all these flavors and textures and sort of different looks to the film. Jason Momoa’s character arc directly picks up from Justice League. Gizmodo: I was surprised that there’s only one mention of the outside DC universe in this film, to explain it takes place after Justice League. Was that always the plan and why was it important to keep this story separate? Wan: Early on we sort of [asked] whether this was a prequel, like Wonder Woman, where they backed it up and did her origin story. But working on the story, thinking more about it in my head, I realised there’s a way I could get around that. I could do his solo movie, post-Justice League, but still make it an origin story. And, obviously, a big part of that is due to the fact that in Justice League, Jason’s character, Arthur, looks so different and has such a different personality to him. I felt that I could actually take him on his character arc for him to realise the hero that he needs to be by the end of the movie, and, henceforth, he becomes the Aquaman as we know it from the comic book. That really is the case. And when you start doing that and start to give him his own journey, literally, his own path that he has to take, he goes to such a different world that doesn’t tie-in with the bigger universe so to speak. It is literally his stand-alone film. Gizmodo: So it sounds like Justice League’s treatment of Arthur ended up giving you a great place to start from. Wan: Yeah, exactly. Having Momoa start off as just kind of a loner and a guy that doesn’t want to have anything to do with anyone meant that he starts off in one extreme way, and I could steer him more and more towards the other way. 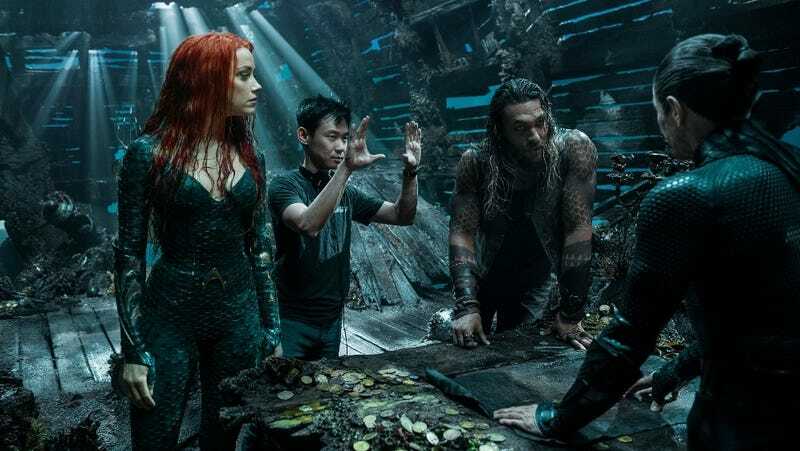 Wan directs Momoa, Amber Heard and Willem Dafoe in Aquaman. Gizmodo: You were making this movie as Justice League came out which resulted in all sorts of behind-the-scenes rumours and drama at DC films. Did that impact your production at all or was it full steam ahead? Wan: I wasn’t really affected in any way at all. I mean I think if there was weird stuff going on and crazy drama behind the scenes people would have reported everywhere [Editor’s note: We did]. People love to report the dramatic narrative behind the scenes, right? [But] there really wasn’t anything at all with this movie. This movie was so straightforward for me. It was really no different to me making one of my low budget horror films in a lot of respects. We were down in Australia, people loved the vision that I had pitched, so I was pretty much left alone to make the film I wanted to make. Aquaman has some extensive flashbacks of what the world was like. Gizmodo: One thing that’s not the same as those horror movies though are the extensive visual effects. What was the hardest thing about those to get right because I heard it was a very long, difficult process? Just in terms of technicality that was the biggest challenge, how do I capture the look? How do I have the actors be in this sort of fantasy world and [actually see them] because I like to shoot as much practical as I can. That’s just my background. That’s my love. And then, obviously, use visual effects to do all the things that I can’t do in the practical world. [But] we put the actors on these crazy rigs that help simulate swimming and floating and then effects come in to do the hair, the costumes and basically create the entire environment around them. So it’s a combination of efforts from of all these artists, and it really took the whole circus to put this production together. 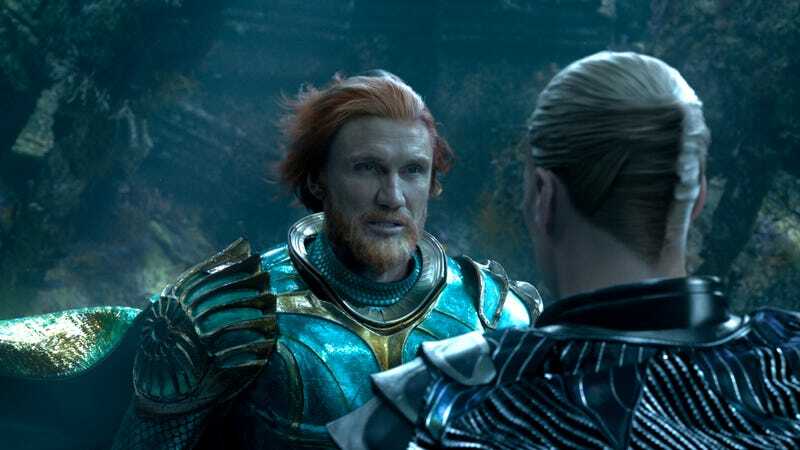 King Nereus (Dolph Lundgren) makes a difficult choice. Gizmodo: So out of all of those things, what is the thing visually and technically you are most proud of with Aquaman? James: From a visual/technical standpoint, the thing I’m most proud of is achieving the look of the underwater world. It was something I took a lot of pride in when I jumped to this project. I really wanted to make a film that felt different. Make a superhero movie that did not feel like your traditional superhero movie, so it doesn’t conform to what we’re familiar with from all the other superhero films that are out there. And so I really loved that aspect of it. It’s a world that we haven’t quite visited before in the cinematic world. At least not to this degree. And coming out and designing striking visuals that that hopefully will live on years from now. Who knows how the movie’s going to do, but I want the movie to live on and be cherished by fans years from now. Kids who grew up watching this film in the same way you and I grew up watching Christopher Reeves fly for the first time in Superman. Having that wonderment. That was what I really want to do is just capture that sense of magic and wonder. Gizmodo: Final stupid question. There’s a shot early in the movie of Atlanna jumping off a dock in slow motion. Was that a nod to James Cameron’s Aquaman from Entourage? Wan: [Laughs] You know I have not seen that season, so it definitely wasn’t intentional. But you know what? That’s the great thing about Aquaman. If Wan had said he put in a wink to that, it would fit right in.